The Lafayette Players were a dramatic stock company composed entirely of African American actors. Originally from Harlem, this first of its kind group introduced audiences to the idea that black actors were capable of taking on a variety of roles and displaying a much greater range than previously considered possible. The concept of a black actors company originated with Anita Bush, the daughter of a Harlem costumer. As a child, she was given the task of delivering wardrobes from her father to professional actors and thus given the opportunity to experience serious theatre firsthand. As a young woman, she pursued a career in dancing. That career was cut short when she sustained a back injury from a backstage accident. Frustrated and directionless after a year of recuperation, Bush attended a play at the Lincoln Theatre (one of two in Harlem which attracted exclusively black audiences) in 1915. Though the theatre had been recently refurbished, it was painfully lacking in attendance due to a dying interest in Vaudeville and the increasing popularity of cinema. Bush presented the idea of a dramatic theatre troupe to the Lincoln Theater’s manager, Marie Downs. She said the idea of black actors presenting more challenging, respectable roles to predominately black audiences would be a great draw. Downs agreed mostly because she hoped Bush’s idea would improve her floundering business. Based on this new opportunity, Bush immediately started searching for actors in Harlem and found a group in two days that would eventually become the core of the “The Bush Players.” They included Charles Gilpin, Carlotta Freeman, Andrew Bishop, and Dooley Wilson (who later found success in Hollywood and is remembered principally for his iconic role as “Sam” in the 1942 classic film, Casablanca. The stock company opened with its first performance, “The Girl at the Fort,” in November 1915. Over time the group continued to perform challenging plays that could be found on Broadway or in Shakespearean theatre. Their performances soon garnered them a fair amount of attention from audiences and some theater critics. As they grew more successful, Marie Downs attempted to rename the group “The Marie Downs Players,” to which Bush responded by re-locating them to the other black Harlem theatre, “The Lafayette,” The acting troupe soon adopted the name of the theater as their moniker. 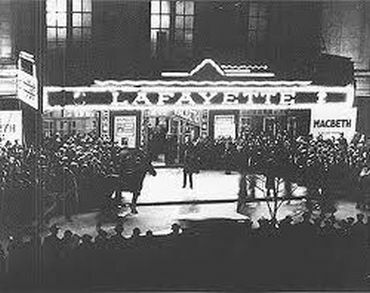 The Lafayette Players became so successful that Bush was invited to form a second theater group in Chicago and another in Philadelphia. A fourth group was formed in the South. By 1924, these four groups had introduced serious drama to black audiences in twenty five major cities with significant black populations. The Depression, however, hit the entertainment industry hard and by 1932 the Lafayette Players and the other three companies had disappeared. Frank Cullen, Vaudeville Old & New: An Encyclopedia of Variety Performers in America (New York: Routledge Taylor & Francis Group, 2007); Francesca Thompson, Drop Me Off in Harlem. Retrieved February 17, 2014, from artsedge.kennedy-center.org/interactives/harlem/themes/lafayette.html.